Uneven follow-up to the Oprah-blessed hit Stolen Lives (2001). That volume chronicled the 20 years the author and her family spent as political prisoners in Morocco. Here, Oufkir charts the strange process of returning to the world of the free. The strongest sections offer trenchant observations about ordinary life. Sickened by the ease with which people waste food, the author finds herself barely able to eat in restaurants; every time she sees a patron pick at complimentary bread and play with pats of butter, she remembers the rotten eggs that were her regular prison fare. She can’t quite get her head around credit cards or ATM machines, either. “We no longer call things by their names,” she declares, disdaining the replacement of plain words like “the elderly” with euphemisms like “seniors.” The book’s overall structure, thematic rather than chronological, works well, and translator Coverdale has crafted a conversational but never chatty tone. Oufkir’s description of her gradual recovery of healthy sexuality is honest and fascinating. Elsewhere, she falters. 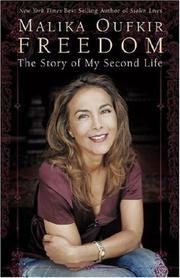 A chapter on fundamentalism has potential, but the author ultimately doesn’t have any real insight into how “religion set itself up handsomely” during her two decades in jail; the section peters out with an unsatisfying story about some Moroccan men who flirt with radical Islam, only to return to secularism. Oufkir can also be annoyingly coy and cagey; she devotes nine pages to the reparations she was paid by the Moroccan government but never tells the reader how much money she received. If she wanted to keep the details private, she should have cut the chapter; talking around the figure is simply distracting. And nattering on about publishing Stolen Lives and meeting Oprah Winfrey is a bit obnoxious. By turns delightful and frustrating.